Hello there and welcome back to my blog. Today I have a really fun card to share with you. I was busting to use these new Sale-a-Bration goodies. I am so excited that this year Stampin' Up! introduced some DIES to the rewards as a Level 2 reward. If you spend $180 (Australian) you can get this gorgeous set of three dies for free. Better still they coordinate with this gorgeous Amazing You Clear Mount Stamp Set that is also a Sale-a-Bration reward choice if you spend over $90. Here's a look at the card that I created with the coordinating envelope. I am really loving making cards with a black card base at the moment. When using brighter colours it really makes them 'pop'. It's quite a dramatic effect. 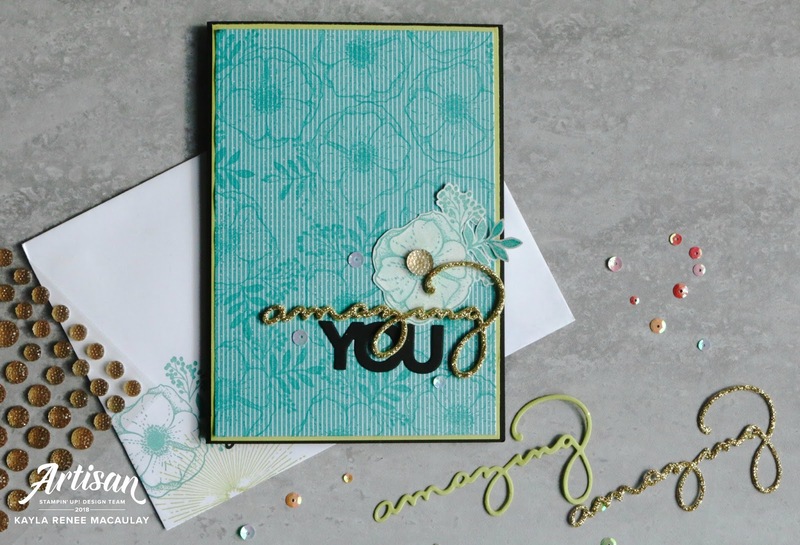 I also used another Sale-a-Bration freebie...the Bubbles & Fizz Designer Series Paper which I stamped with the gorgeous flower from the Amazing You Stamp Set. 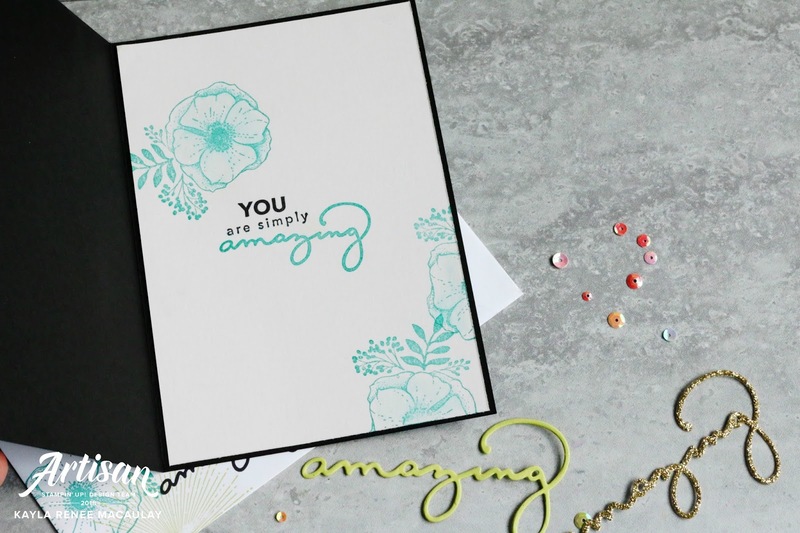 I accented one of the flowers by stamping it on Whisper White Thick Cardstock in Bermuda Bay and colouring it with Clear Wink of Stella to give it a sparkly and slightly blended appearance (the Wink of Stella acts as a bit of a watercolour brush). I also added a piece of white to the inside and stamped it to match the front of the card. I love adding additional sentiments and embellishments to the inside of my cards. Here's a close up look at the finished card. 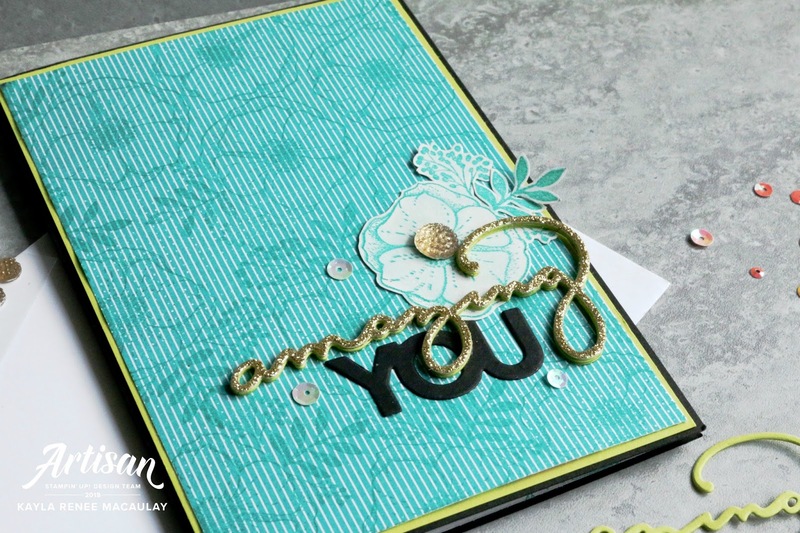 I used a really fun technique to make the die cut look 3D by cutting the 'amazing' from Lemon Lime Twist cardstock six times and adding an additional cut of Gold Glimmer and adhering them altogether. It makes for a really statement piece. I hope you enjoyed a look at this fun card I made using Sale-a-Bration goodies. Don't forget you can get these goodies by shopping between now and the end of March in my store.